Calling Anna Lippincott a bold warrior doesn’t do justice to her vivacious nature. She knows who she is and what she believes, and she conveys those beliefs with persistence and good humor. Growing up in a conservative Catholic family, my parents raised me to be independent, strong and true to my beliefs. When I began college at Ohio University (Athens, OH), I experienced major culture shock and quickly realized that conservative voices were not only scarce, they were not welcome on campus. Year in and year out, I experienced hate speech, ridicule, and even threats of violence against me for being an extremely vocal conservative voice on the 20,000-person campus. She was already interested in local and state politics, and Washington DC attorney Cleta Mitchell (her favorite speaker that summer) inspired her to ensure that liberal voices aren’t the only voices heard – on campus or in the public sphere. Anna found the various training seminars she and her fellow interns received quite helpful on campus. While OU is overwhelmingly liberal, I was able to take the skills I learned at CLBPI and use my voice effectively on campus. CBLPI provides amazing resources to teach fellows how to communicate wisely, especially in the face of adversity. Through speech coaching, learning the facts, gaining confidence in our skills, event planning and rallying, connecting us with likeminded woman and so much more, fellows are able to understand the tools necessary to make their voices heard. 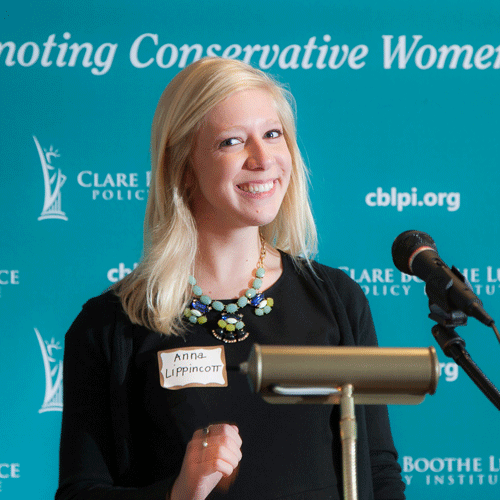 After interning at CBLPI, I went back to OU with the ability to spread the conservative message. I brought ‘Factual Feminist’ Dr. Christina Hoff Sommers to campus, I began an annual conservative women’s day, I met regularly (probably more regularly than she would have liked!) with the Dean of Students and senior faculty to discuss staffing and lack of diversity of thought concerns, I landed a spot on the liberal newspaper’s controlling Board of Directors, and I helped expand my network of likeminded women, with whom I still regularly communicate and express ideas. At the time, Anna’s plans included law school, but life has a funny way of introducing new opportunities. While I was stomping around campus causing a scene, I became close with Congressman Johnson (R, OH-6), who offered me a great opportunity: if I could learn to fundraise, by the time I graduated, he would be looking for a fundraiser. I worked as the congressman’s Ohio fundraiser for a year before leaving to begin my own small fundraising shop. Today, Anna is a business owner running her own consulting and fundraising firm. She works with public and private clients to establish fundraising goals and manageable ways to achieve them. I just celebrated my two-year-anniversary fundraising for a wonderful group of people, who include the Speaker of the Ohio House, members of the Ohio House candidates for Ohio House, and a 501(c)(4) organization which promotes energy independence & economic development in Ohio. When I began working for Speaker Householder, we set out with a goal: recruit great, conservative candidates for the House, get them elected, develop great members. In a tumultuous cycle that included a lot of people trying to stop us, we were able to raise nearly $7 million in campaign contributions and successfully kept Ohio’s supermajority! After a demanding electoral season in her state, Anna took time off over the Christmas holidays to travel to southern Spain and Morocco. Revitalized, she’s back at work and looking forward to the year ahead. Our goal has not changed, and we are already looking forward to 2020! I will continue fundraising independently, adding more House members and candidates to our growing list.